Natasha Trethewey, recipient of the 2007 Pulitzer Prize for Poetry and the Lillian Smith Award for her book, "Native Guard," becomes the 19th Poet Laureate. Emory Photo/Video. Emory University Professor Natasha Trethewey, a Pulitzer Prize-winning poet who was recently appointed the 19th U.S. Poet Laureate, will serve as keynote speaker for the 7th Annual AJC Decatur Book Festival. Emory is a major sponsor of the book festival, which runs Aug. 31 through Sept. 2. The largest community-supported independent book festival in the nation will bring more than 300 authors to downtown Decatur over the Labor Day weekend to participate in talks, readings and panel discussions. Events are free and open to the public. This marks the first year that the festival’s keynote speaker is also a Decatur resident, notes AJC Decatur Book Festival Program Director Terra Elan McVoy. “We had already confirmed her (to participate in) the festival when we learned that she had been appointed U.S. Poet Laureate,” McVoy recalls, noting festival organizers were “beyond thrilled” at the news. “She’s been a wonderful supporter of the festival, and we thought she would be a perfect keynote speaker,” she adds. The invitation to serve as festival keynote speaker came during a public reception June 6 on the downtown Decatur Square to celebrate Trethewey’s national recognition as 2012-2013 U.S. Poet Laureate. 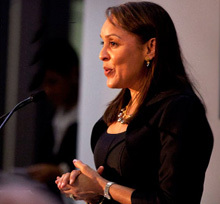 Trethewey, who will direct Emory’s Creative Writing Program this fall, received the Pulitzer Prize in 2007 for her collection “Native Guard.” She is the Charles Howard Candler Professor of English and Creative Writing at Emory and was also named Poet Laureate of Mississippi. Check www.decaturbookfestival.com for more information, including a list of participating Emory faculty and alumni authors.